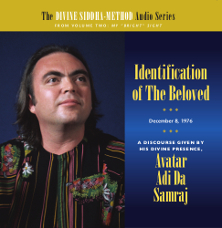 Avatar Adi Da draws us into noticing the true nature of this world, in which we find the Beloved—the True Loved One—only in its passing forms. This leads to attachment to what is temporary, generating a constant cycle of reaction and seeking for a Happiness that will overcome death. Adi Da Admonishes everyone to find the True Beloved, in Its Eternal Form—our True Condition—if Happiness is to be truly found. You must recognize the Beloved Appearing here in all this attraction—which means you must enter into a Spiritual process in your living rather than the conventional attempts to survive, to win, to live forever. If you become truly committed to it, in a relatively short time you literally pass out of the limitation in which you now conceive of this world. But you must utterly surrender. You must give up everything, for That, for what you recognize, for That Truth, That Condition. © 2015 ASA. All rights reserved. that it not be reproduced or modified without consulting ASA.